Reference Series powered subwoofers shatter your expectations for deep driving bass by playing louder and going deeper than significantly larger designs creating the most dramatic intense bass you've ever heard or felt. Designed from the ground up for class-leading room-filling low-frequency performance the RSW-10 is sonically cosmetically and technologically matched to the Reference Series. 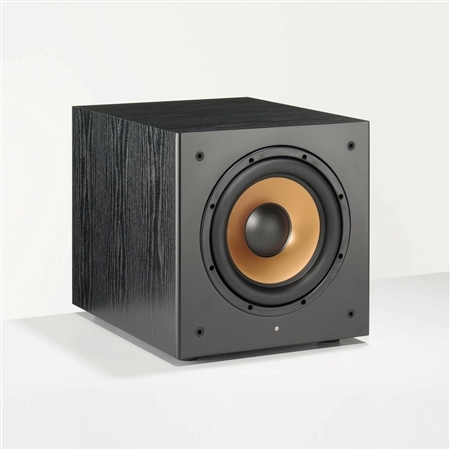 Low-level inputs that also operate as an LFE input (for compatibility with 5.1 digital sound formats) and an adjustable low-pass crossover allow you to configure the subwoofer to your room's acoustics. The easy-to-reach side-mounted volume control makes for simple setup and convenient level adjustments between music and movie sources. The RSW-10 matches a 10" front-firing Cerametallic™ passive radiator and a 10" rear-firing active driver to a high-output BASH® amplifier generating enormous sound from a surprisingly compact cabinet. It delivers more thundering low bass with greater clarity than much larger subwoofers and is finished in unobtrusive durable black vinyl. The RSW-10 is available in only a 120 volt version.